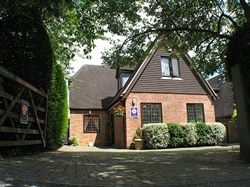 4 star B & B accommodation in Marlow, just 3 minutes drive to central Marlow, 5 minutes from High Wycombe. Silver Award from British Tourism. All en-suite accommodation. Very comfortable. Superb English breakfast included, or continental if preferred. Off street parking, very quiet location. Collection from Heathrow. London 30 minutes by train. 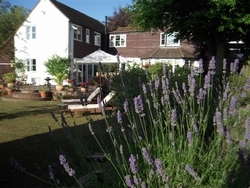 Swiss Cottage is a Four Star, Silver Award bed and breakfast set in the peaceful Marlow Bottom valley. 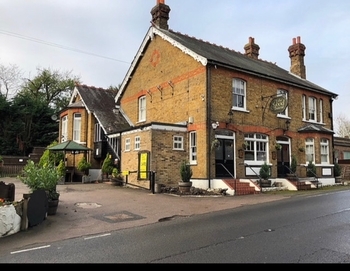 Just a three minute drive from central Marlow, the B&B provides much of the quality and comfort found in a Five Star hotel, but with the attentive, personalised service and value for money of a much smaller establishment. John and Judy Hollidge, the proprietors, provide guests with a warm welcome and give their attention to even the smallest details to ensure the comfort of their guests. 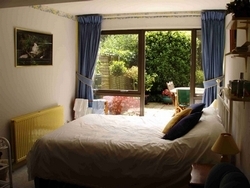 Tastefully decorated throughout, the bedrooms are a haven with comfortable beds and fresh cotton bedding. The power showers are strong and refreshing, accompanied by fluffy towels and a range of quality toiletries. For breakfast, the emphasis is on fresh quality ingredients, often locally sourced and much of which is deliciously home-made. Whether your stay is for business at Marlows Globe Business Park or in the neighbouring towns of High Wycombe, Maidenhead or Bourne End ...or you are visiting for leisure many guests enjoy the nearby River Thames and the delightful array of shops in Marlow - as well as Windsor, Legoland, Henley and Oxford ...so if you are looking for accommodation in Marlow you can be assured of an enjoyable stay at Swiss Cottage. All major credit cards accepted. A warm welcome to Herons Nest. Herons Nest, Bed and Breakfast provides a home from home environment you will love. Our accommodation comprises of a one bedroom luxury annex with en-suite bathroom along with a separate living and breakfast area. We offer a generous selection of complimentary facilities in your home from home stay, including Free WiFi, Fresh bathrobes and slipper,TV flat screen, Fresh coffee and tea, and hair dryer. All our food is homemade including our bread and selection of preserves, our meat is locally sources and eggs are as youd expect free range and farm fresh. The food we serve includes a full english breakfast at weekend and good-to-go breakfast, afternoon tea and a traditional fish n chips supper. We can also cater for special dietary requirements such as gluten, wheat, dairy, vegetation and vegan please let us know when ordering your food as you make your booking. We are situated in the centre of Marlow-on- Thames and a short walk away from the railway station, town centre and globe business park. Marlow has easy access to the M4 and the M40 from the A404 by-pass is just a short drive away and is close to the bigger towns of Maidenhead 10 minutes drive, High-Wycome 10 minutes drive, Windsor 20 minutes drive and London. Marlow boasts 36 fabulous places to enjoy delicious food. Not forgetting, of course, the prestigious Hand and Flowers eatery, run by top chef Tom Kerridge and awarded two michelin stars. Which, incidentally, was run previously by my Mother and Father for 22 years before Tom took over. And, my favourite hidden gem the Vanilla Pod - great food and a wonderful atmosphere. The list goes on, there is something for everyone. Marlow is situated on the River Thames, a beautiful town with over 25 English pubs and restaurants. The town dates back 1000 years and has many historical sites. Only 25 minutes from Heathrow and 35 minutes from London, and with access to the lovely Chiltern Hills for walking and cycling. The river itself offer many attractions, with boat rides, walks, regattas, and riverside pubs. 30 minutes to Oxford with its dreaming spires, and 20 minutes from Windsor Castle there is so much to see in this area. Theatres, Art Galleries, Museums, sports facilities, spas, childrens entertainment, zoos, stately homes all abound around Marlow. Excellent shopping facilities, whatever you taste. Marlow on Thames Where is it? Marlow sits by the River Thames, in South Buckinghamshire on the border with Berkshire and 6 miles from Oxfordshire. London, Oxford and Reading are within easy travelling distance. The closest towns are Henley, Maidenhead and High Wycombe. The River Thames Marlows main leisure focus is the River Thames where pleasure boat trips, canoeing, sailing and rowing are available and fishing of coarse. The boating public can access the river in several places and small boats, power & sail can be slipped at the end of St Peter Street. The banks are ideal for strolling, cycling and picnicking. For the many walkers the new Thames Path is a National Trail that passes through Marlow. Mostly following the old towpath, this path meanders with the Thames, right from its source near Cirencester. Level going, and easily accessed by a variety of transport the Path is family-friendly, and suitable for inexperienced hikers. It is already enormously popular. Eating Out & Shopping There are more places to enjoy a good meal in than you can shake the proverbial stick at - Italian, Indian, Chinese, Mexican, Thai, even British - Marlow has them all, dozens of them. A rich variety of retail therapy greets visitors from exclusive ladies dress-shops to some excellent charity shops. For more information click onto the Marlow Town and Tourist Information websites. Marlow is an ancient and very pretty town, situated on the River Thames. Easy access to London with its theatres and art galleries and 2000 year history. Marlow itself is a tourist town, with over thirty restaurants, coffee shops, lovely parks and beautiful walks in the Chiltern Hills. Many golf courses, river attractions, and other sport facilities. Lots of local history, stately homes Clifton just 5 miles away and places of interest.